BE A SAFER DIVER Stop Reacting, Learn To Respond Appropriately Instead! You've taken the plunge into diving, you've improved your skills through the PADI Advanced Open Water Course. You're probably asking yourself what now? Well now it's time to give something back. As a PADI Rescue Diver, Emergency Oxygen Provider, or Emergency First Response, you'll develop the skills needed to someday save someone's life. These courses are designed to not only make you a better diver by giving you the skills and confidence to respond to an emergency but also how to keep a close eye on your dive buddies and stop an emergency before it even happens. 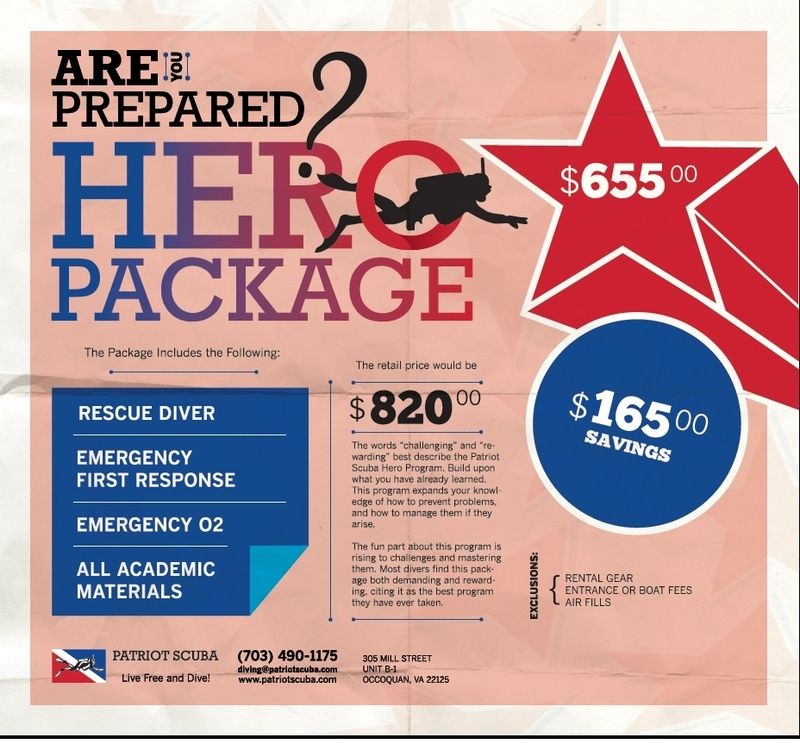 Patriot Scuba's Hero Program - A Great Value! Looking for the a cost effective way to be a life-saver? Patriot Scuba's got you covered. Patriot Scuba has bundled together all the needed courses to set you up as the safe diver everyone wants to buddy with. Combining the Rescue Diver, Emergency First Response, and Emergency O2 provider courses into one bundle saves you a bunch of cash and may help you make the difference in someone's life. With a price of just $655 and a total savings of $165 through 3 classes Patriot Scuba makes it cost effective to make you and your buddy safer divers! Contact us at Patriot Scuba to get started!